As you probably already know ADHD - Attention Deficit Hyperactivity Disorder can be very difficult to live with. Other people can actually think that you are deliberately being annoying, when in all actuality you are just being yourself! Hypnosis for ADHD (Attention Deficit Hyperactivity Disorder) can help you to become calmer and more relaxed, to be able to focus quietly when you want to, without dulling your senses or taking away your awareness. The good news is that ADHD has it's positive sides too. For example, there are certain activities at which people with ADHD often have the advantage such as accomplishing daily tasks quickly or using it to excel in a career that requires fast talking or movement. In addition, people with ADHD often have expanded creativity and intuition. So, it's not necessary to get rid of your ADHD but rather, you just need to learn to focus and concentrate quietly when you want to. Sometimes ADHD sufferers wonder whether they can be hypnotized, because they often find it difficult to focus on one thing and get into a relaxed state. What's surprising is that hyperactive people are often more prone to hypnotic trance phenomena, and there is a very high success rate in hypnosis for ADHD. Again, it's not about curing ADHD, but about managing it so that it doesn't stand in your way anymore. 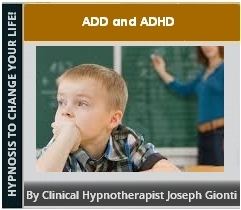 This audio is percent for children and adults, so whether you are looking for a completely natural way to control your ADHD, or maybe you're looking to compliment your current program, our subliminal ADHD audio will help you take control.